The extended-length GoCart is ideal for larger, wider tyres. The RCD-1500EX supports tyres up to 330 mm wide and 991 mm in diameter. Ideal for many light-duty trucks and SUVs. The extended-length RCD1500EX car dolly offers the same ​680 kg weight capacity as the standard-length version, but it holds tyres from 483 mm – 991 mm in diameter. This ability to secure larger tyres means a set of GoCart dollies will let you move larger, light-duty trucks and SUVs. With multiple locks on each dolly, including both a sliding pin and a hook latch to restrict the possibility of dolly movement while you roll your vehicle, it’s extraordinarily safe to move raised vehicles. 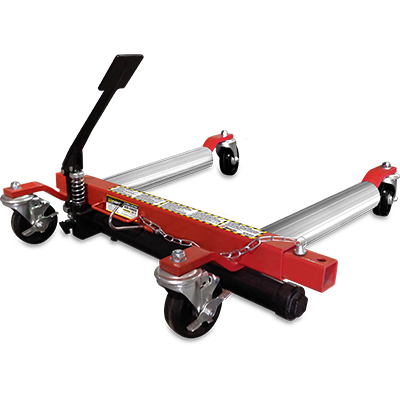 The front wheels of the dolly also include an on/off lever, so the wheels cannot move once you need to lower the car and remove the dollies from the vehicle wheels. Non-skid polymer rollers engage the wheel, safely grabbing the tyres for maximum hold. The skid-proof construction guarantees custom and speciality tyre/wheel configurations won’t be damaged or marred. Nearly silent urethane wheels promote safe usage on many types of flooring. Under heavy load, the urethane wheels actually improve dolly performance. Urethane is the best material for wheels, and they work on all types of terrain, including grass and dirt. Each car dolly is finished with a durable power coat in the beautiful red gloss that has become synonymous with Ranger’s recognisable brand. The coating is waterproof, fade-resistant and meant to last for years of heavy use. Extended-length GoCart car dollies are sold in sets of two or four. To get the best value, we recommended first-time buyers purchase a full set of four. This is because each car dolly set comes with a storage rack pro-rated in the purchase price.